Sidney Poitier | WHAT A FEELING! It is difficult to synopsize Fast Forward without blushing, but I’ll try: This movie is about eight perky and vivacious youths from Sandusky, Ohio, who travel to New York to find their fame as singers and dancers by winning an annual open call talent show. Now that we’re all thoroughly embarrassed, let me point out the obvious and say that what we have here is the latest entry in the Fame–Flashdance–Footloose marketplace (and just in time for the holiday weekend). Which is to say, a film that cleverly mixes loud music, choreography, and a bunch of pearly-toothed dancers to cook up a big barrelful of cornpone. As for any kind of veracity when it comes to painting a recognizable picture of human beings or modern success or even New York City, forget it. Frankly, although some conventional plot complications get thrown at them, the gang has a pretty easy time of it. These kids show up at the offices of a major promoter. He’d personally guaranteed them an audition for the big talent contest the last time he passed through Sandusky. Wouldn’t you know it—the old boy dies before they get there, and the sleazy new managers won’t give them a chance. Does that discourage our apple-cheeked heroes? Well, yeah, a little. But they quickly take to dancing on the streets to earn money until they can slide their way into an audition. Then the leader (John Scott Clough) catches the eye of a girl from a wealthy family, who invites the group to perform at her mother’s lavish lawn party. She also gets into some heavy breathing with Clough. But he’s already involved with one of the members of the troupe (a honey named Tamara Mark); the latter gets understandably miffed and threatens to tear apart the close-knit company. The biggest threat, though, is posed by a rival group of dancers, who demonstrate (though a lively “dance war”) that our heroes are way behind in the hipness department. This is one of the film’s few honest admissions: The fact is, these routines are so squeaky-clean, the gang wouldn’t stand a chance of getting anywhere in showbiz. Unless, that is, TV variety shows come back, and there is a renewed need for the June Taylor dancers. When Sidney Poitier’s last outing as a director was released (Hanky Panky), he seemed to be bucking for the mantle of Worst Director in Hollywood. Well, he’s cleaned up his act a bit and this is a smoother show. In fact, for all its ineptitude, and perhaps because of it, Fast Forward cruises in an almost infectiously ridiculous atmosphere of badness—the out-and-out stupidity of it all becomes hard to resist. Fame. Flashdance. Footloose. Fast Forward. Notice anything funny there, in an alliterative way? Is there something subliminal going on here? 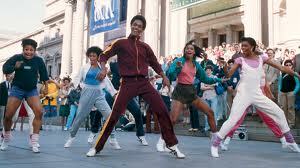 Are the filmmakers sending out coded messages to the dance-hungry teenage audience? There may be a graduate thesis in this. But, then again, let us not waste our time trying to discover why this is happening. Is there any way we can stop it? They’re still making this movie, even if they stopped doing the “F” thing. Whatever this review is, I guess it’s what happens when you see too many of these. Also, how could a guy with a name like John Scott Clough miss? I seem to recall him as the poor man’s Tom Everett Scott.